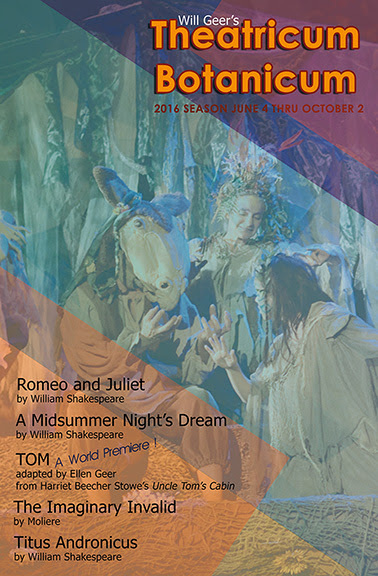 In 2016 we celebrate the 400th anniversary of William Shakespeare’s death and, in Topanga Canyon, Will Geer’s Theatricum Botanicum will feature three of Shakespeare’s classics as part of its upcoming summer season. Romeo and Juliet, Titus Andronicus, and the company’s signature production of A Midsummer Night’s Dream will join Tom, a world premiere adaptation with music and The Imaginary Invalid for another spectacular season outdoor under the oaks. June 18 sees the opening of TOM, a world premiere adaptation with music, written and directed by Ellen Geer, that brings a fresh perspective to Harriet Beecher Stowe’s classic novel, Uncle Tom’s Cabin. Long before Black Lives Matter became part of our lexicon, Stowe’s great novel demanded freedom and equality for all, changing forever how Americans viewed slavery, galvanizing the abolition movement and contributing to the outbreak of the Civil War. Opening July 9, Mary Jo DuPrey (last season’s August: Osage County) directs Constance Congdon’s fresh and hilarious adaptation of The Imaginary Invalid, Molière’s skewering of the health care profession from an entirely different century. Plagued by a growing pile of medical bills, Madame Argan (Ellen Geer), a chronic hypochondriac, will go to any length to marry her daughter off to a doctor. Of course, her daughter has other ideas. This potent elixir of romantic triangles, double entendres and mistaken identities proves, in the end, that laughter really is the best medicine. Also starring Alan Blumenfeld as Dr. Purgeon. Beginning July 30, Titus Andronicus, directed by Ellen Geer, joins the season repertoire. How should a nation choose its leaders? What happens when a government insulates itself from the citizens it once served? What is the difference between justice and revenge? Theatricum sets Shakespeare’s first tragedy, the violent tale of a government gone awry, in the future, to spark a flame of caution… but always with a flicker of hope. The season also includes the return of A Midsummer Night’s Dream, a beloved company staple that heralds the arrival of summer in Topanga. Once again, the most magical outdoor setting in Los Angeles is transformed into an enchanted forest, inhabited by lovers both fairy and human. Director Melora Marshall conjures up Shakespeare’s world of wonder, magic and romance. Comical misunderstandings and the pain of unrequited love are resolved, and all is reconciled through midsummer night revelries and the enduring power of nature. Additional special performances throughout the summer include Momentum Place, full of modern dance, aerial acts, juggling and performance art curated by Lexi Pearl, Theatricum’s second annual Family Barn Dance and Bar-B-Que, The Woody Guthrie Story, a concert by Inara George and Friends, and Alsop for Adults, an evening of delightfully funny political songs by singer/songwriter Peter Alsop. For tickets and more information, call 310-455-3723 or go to www.theatricum.com. Subscribe before Shakespeare’s birthday (April 23) for additional savings.